Don't let the looks fool you. Cue Acoustics' wireless PS1 speakers aspire to not only exist alongside larger (and more expensive) tower speakers often coveted by audiophiles, but also among streaming audio devices. And these don't need a subwoofer either, because it's built-in. In each of the PS1 speakers, there's a 3/4-inch tweeter, 3.5-inch midrange speaker and a 5-inch, down-firing sub-woofer built into the underside of the speaker. You also don't need an amplifier for these, or wires, for that matter. The PS1 system is powered by a D2 Audio amplifier (300 watts RMS total power) and functions as a DLNA media renderer. That means all you need is a device capable of pushing an audio signal to the speakers and you're good to go. (You can also connect wired sources, like TVs to the speakers via a wireless interface box (optical and analog audio accepted). The on thing you need the wire for at all is for power. 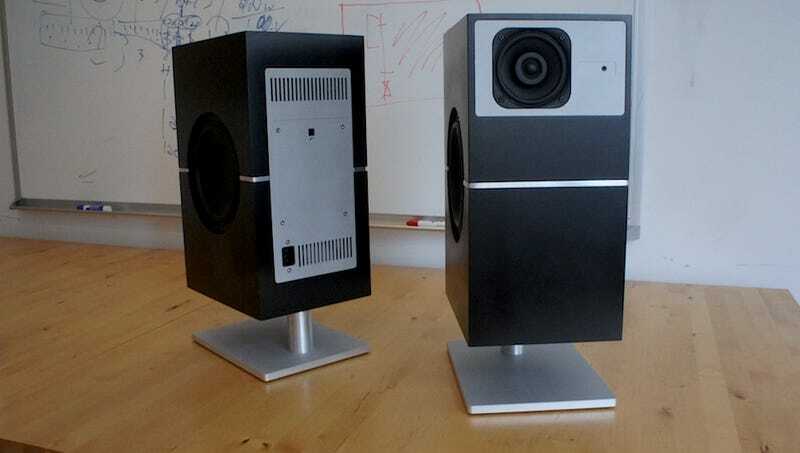 The PS1 speakers stand roughly 18 inches tall, are 8 inches wide and go back about 10 inches. I only got a look at the engineering prototypes, which lack all the final touches (like speaker grills), but the design is handsome and modern. Made of fiber composite material and aluminum, they're something you don't necessarily want to hide. They're also heavy. 18 pounds heavy. They may be bookshelf speakers, but don't mistake them for something you attach to a computer or mini-system. These produce some sound. I only got a brief demo, but they were impressive. Highs were nuanced and crystalline. The slightest details of acoustic guitar strings can be picked up to the point where the sound is nearly three-dimensional. Mids were defined and robust, not muffled and relegated to the background. And the bass? It's there, and then some. The songs used as samples were pretty tame as far as bass goes, but you could still feel the resonance of kick drums and basslines. I'd be curious to see how well these hold up with genres such as hip-hop and electronic. With a frequency response as low as 27Hz (and a tolerance of 1.5db), the secret to the big low end sound lies in the dual passive radiators on each side of the case. Cue CEO Sam Millen says they resonate at their own specifically-tune frequency, and generate the same push of air that a bass reflex pipe in a taller floor speaker would produce.